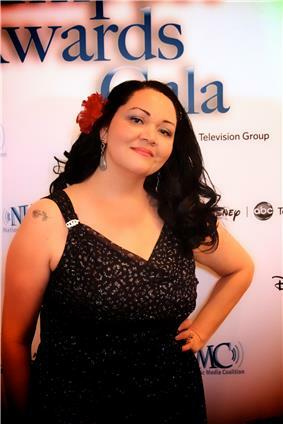 Josefina López (born 1969, San Luis Potosí, Mexico) is a Chicana playwright, perhaps best known as the author of the play (and co-author of the screenplay) Real Women Have Curves. López was born in 1969, in San Luis Potosí, Mexico, and at age five emigrated with her family to the United States, where they settled in Los Angeles, California. She graduated from the Los Angeles County High School for the Arts before obtaining a BA in film and screenwriting from Columbia College Chicago, and an MFA in screenwriting from the School of Theater, Film and Television at UCLA. After having over 100 productions of her plays throughout the United States, Josefina López is one of today's preeminent Chicana writers. She has written several plays such as Simply Maria, Or the American Dream; Confessions of Women From East L.A.; Boyle Heights; Lola Goes To Roma; Food For The Dead; Unconquered Spirits; Queen of the Rumba and Real Women Have Curves. She is the co-screenwriter of the film version of her play Real Women Have Curves, starring America Ferrera (Ugly Betty) and Ingrid Oliu (Stand and Deliver). The movie garnered much acclaim, including at the 2002 Sundance Film Festival where the film won the "Audience Award" and a "Special Jury Award for Acting." Josefina has written several other screenplays including Loteria for Juarez about the mysterious murders of women in the Mexico/US border town of Ciudad Juárez; ADD Me to the Party, an original comedic screenplay about three Latinas addicted to adrenaline who drive around in an Impala looking for the next distraction; Lola Goes To Roma, a mother-daughter comedy that takes place in Europe; a biopic titled Queen Of the Rumba, and a family comedy titled No Place Like Home. López has won several awards including a Real Women Have Curves. She was awarded a Screenwriting Fellowship by the California Arts Council for 2001 and in 1988 she was recognized by California Sen. Barbara Boxer as a "woman who has made history in the entertainment industry". López's first novel, Hungry Woman in Paris, was published in March 2009. She taught writing courses at California State University Northridge in the mid 1990s. She is the founder of "Casa 0101 Theater Art Space" in Boyle Heights, where she teaches screenwriting and dramaturgy. ^ "Real Women Have Curves". Retrieved 2010-11-06. ^ a b c d e f "Biography". JosefinaLopez.com.